STUNNING 1965 AUSTIN-HEALEY BJ8 3000 MK3. COMPREHENSIVE RESTORATION BY KNUTT HOLZER. FINISHED IN BEAUTIFUL HEALEY BLUE OVER NAVY BLUE LEATHER WITH A NAVY TOP, BOOT, AND TONNEAU. DURING RESTORATION SOME ENGINE MODIFICATION WERE MADE TO MAKE THIS CAR FASTER, SOUND BETTER, AND GET BETTER GAS MILEAGE. IT HAS AN UPGRADED 5 SPEED TRANSMISSION. 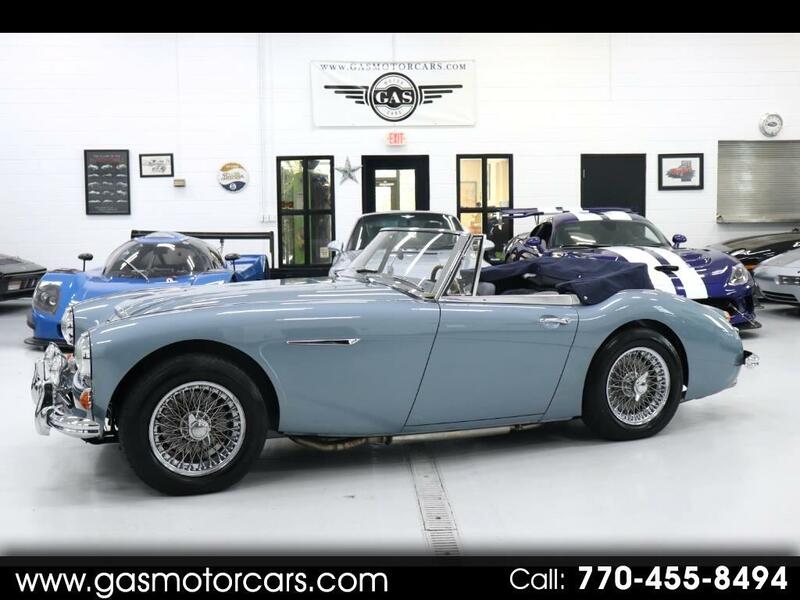 THANKS TO THE AUSTIN-HEALEY HERITAGE CERTIFICATE WE KNOW THAT THIS HEALEY WAS DELIVERED NEW IN MIAMI FLORIDA WITH A LOT OF FACTORY OPTIONS SUCH AS WIRE WHEELS, ELECTRIC OVERDRIVE, HEATER, LAMINATED GLASS, AND MORE. THIS CAR IS A SCREAMER. QUITE POSSIBLY THE BEST SOUNDING HEALEY WE HAVE EVER SEEN AND HEARD. THE UNDERRIAGE IS ABSOLUTLEY CORRECT AND FULLY DETAILED. THE UNDERSIDE IS JUST AS STUNNING AS THE EXTERIOR. THERE ARE SOME VERY COOL PERIOD CORRECT RALLY GUAGES BY SMITHS AND HEUER, DRIVING LAMPS, AND A FEW OTHER UPGRADES. GAS MOTORCARS INC IS A FAMILY OWNED AND OPERATED DEALERSHIP LOCATED IN MARIETTA, GA. WE ONLY SELL VEHICLES OF THE HIGHEST QUALITY. WE CAN PROVIDE CLASSIC CAR FINANCING FOR QUALIFED BUYERS. WE CAN SHIP ANYWHERE IN THE WORLD. PLEASE CALL TO SET UP AN APPOINTMENT TO VIEW THIS VEHICLE. Message: Thought you might be interested in this 1965 Austin-Healey 3000 Mark III.